It’s the question many people ask today. A woman preparing for confirmation as an adult wondered how faith in Jesus the Christ and its simple “Thou shalt love thy neighbor as thyself” became a complex system of Christian beliefs, morals, rituals, theologies and a diverse family of churches. 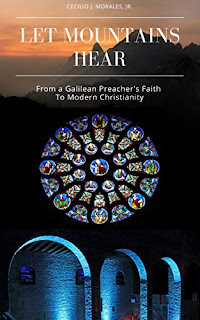 Let Mountains Hear: From a Galilean Preacher’s Faith To Modern Christianity (e-book) by Cecilio J. Morales, Jr., a journalist with experience covering religion and a life of grappling with faith, aims to provide an answer for every person in our modern world — in the pews or out in the streets and the marketplace. The work is not intended to advocate on behalf of a particular denominational nor a particular scholarly opinion, but rather to convey simply the often complex historical facts to the average reader. How did we come to have Christianity? Gaze at a speaking and burning bush, hear the roaring voices of judges, kings and prophets. Watch a Galilean who marveled many, confounded a few, then was executed, only to rise from the dead. Then explore centuries of epic arguments about what that story meant, how it changed in the retelling, recasting and reforming into the Christian faith ongoing today. Toward the Third Millennium, the quest begun in the 19th century to define a modern faith. The work is available at Google Play, Barnes & Noble, Amazon and other fine online stores in e-book format. Publication date: Nov. 12, 2018. Cecilio J. Morales, a journalist, has covered news concerning religious developments, labor economics, foreign relations and Hispanic affairs. He was an editor with the London-based Latin American Political Report and a stringer for what was in the 1980s known as Religious News Service (now Religion News Service), before becoming an editor and publisher of specialized publications. He also contributed features, opinion pieces and book reviews to a number of major U.S. newspapers and magazines, including The Washington Post, the Hispanic Link News Service, the Jesuit newsweekly America and the National Catholic Reporter. Currently an Anglican, Mr. Morales was for four years an adviser and editor at what is now the U.S. Conference of Catholic Bishops.